Do you know when you get an idea in your head, and you can't rest until you see it through? These gyozas were one of those ideas, for me. I love gyozas of all flavours, but they always seemed like they would be tricky to make from scratch so I'd relegated them to a restaurant-only dish. However, after reading Lil's post on them, I got it into my head that I needed to try it for myself and, after a trip to the Asian supermarket for wrappers (they were in the frozen section!) and a read of this recipe, I was armed and ready to go. And, you know what? They were easier than I thought. Almost therapeutic to make: a little like origami. Ever since, I've been making big batches of these, and freezing them for mid-week dinners. I serve them with a steaming hot bowl of noodles and stir-fried veg, with some sesame oil and soy sauce. A few sesame seeds never did any harm, either. They're so satisfying and, after the initial time outlay, so quick and easy. 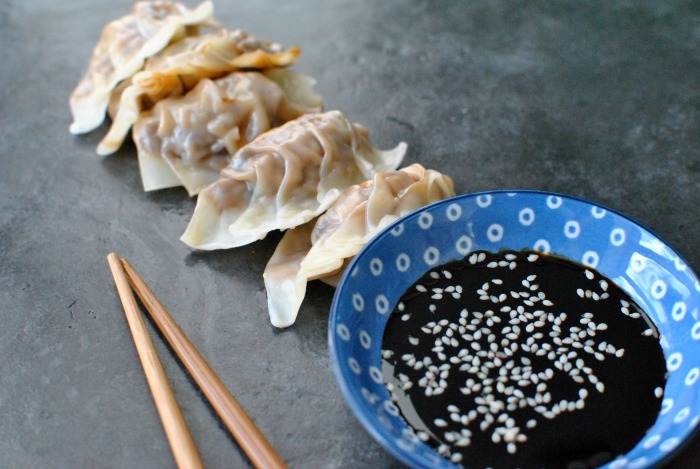 It's something a little bit different and, although my dumplings will never be as good as Dorshi's, they're pretty darn tasty, too. A word of warning: these will stick to the steamer! I used my standard metal steamer (the one I use for veggies), and the first time I had a bit of a disaster, with the wrappers all ripping open, leaving everything a bit of a mess. The next time I greased the steamer with a little bit of olive oil before putting in the gyoza, and there were no problems! I'm sure there are more technical ways of doing it, or equipment you can buy (one of those bamboo ones, perhaps?!) but I was working with what I had! Oh, you can also stick the steamed gyoza in a frying pan if you want a slightly crispier finish, but I like them just steamed. Mix together the mince, chilli, garlic, spring onions, ginger, fish sauce and soy sauce until well incorporated. You want an even mix of all the ingredients and flavours in each dumpling! Place around a tablespoon in the centre of each wrapper. Wet the edges and fold over until sealed. Wet the sealed edge and pleat gently all the way along. Set on a baking tray lined with baking parchment. Try not to place them too close together, as they'll stick together! Repeat until all the mixture or all the wrappers are used up. Steam for 12-14 minutes until the centres are piping hot. You can freeze the gyozas by placing the baking tray(s) in the freezer - make sure the gyozas aren't touching as they'll stick together and potentially rip when cooked. Once they're frozen, you can transfer to bags or tupperware. 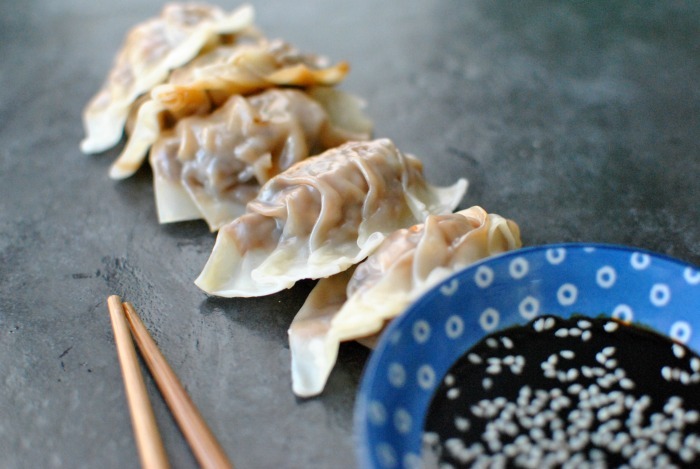 You can cook the gyoza from frozen - just steam for 15-17 minutes and make sure the insides are hot before eating.